Some scholars, priests, mages, knights or traders need equipment to transport important documents in. This is our "Alrich"s' pencilcases' purpose! There is a loop on the backside of the case, which allows to be pulled through a belt. This way the case can be combined with many more pouches and belt bags. By the use of leather strings the lid and the bottom are attached tight to the case. "Alrich" is closed with a bucklestrap in the front. This way it cannot open unintentially. 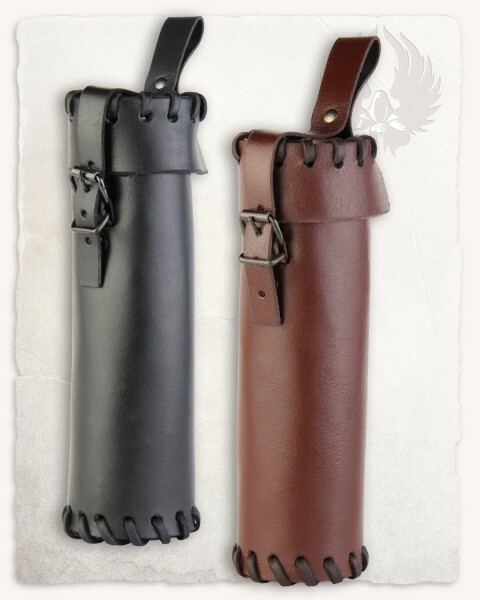 This pencilcase is completely made from leather and can be purchased in either brown or black.